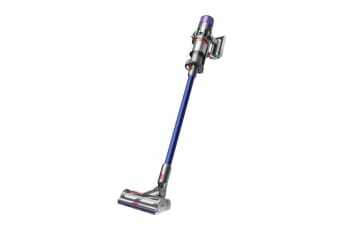 Cut chore times with the Dyson V11 Absolute Cordless Vacuum, an intelligent cord-free vacuum that optimises power consumption and run time. The dynamic load sensor intelligently controls the motor position 360 times a second, to detect brush bar resistance and automatically changes the motor speed between hard floors and carpets. With the single-button control, you can simply switch between power modes and make on-screen selections. Air flows directly from the cleaner head to the motor, helping to generate 20% more suction power than the Dyson Cyclone V10 vacuum. The LCD screen displays performance in real time, including second-by-second run time display, current power mode, filter maintenance reminders and blockage reports. A larger roller covered in soft woven nylon and anti-static carbon fibre filaments remove fine dust and larger debris from delicate hard floors. Acoustic material absorbs vibrations, while a post-motor filter and an acoustic baffle reduce volume further. 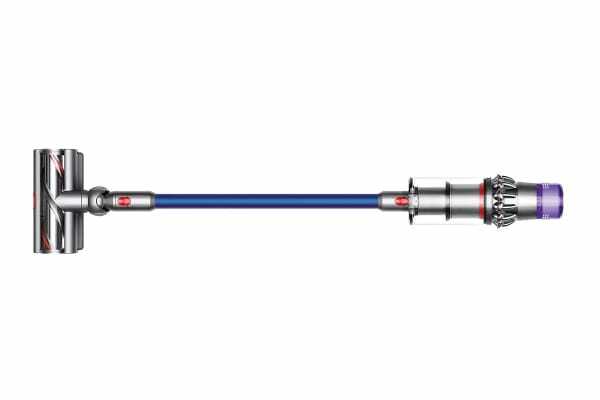 The Dyson Cyclone V11 vacuum drops into the wall-mounted dock, to recharge and to tidily store the tools, ready to grab and go.